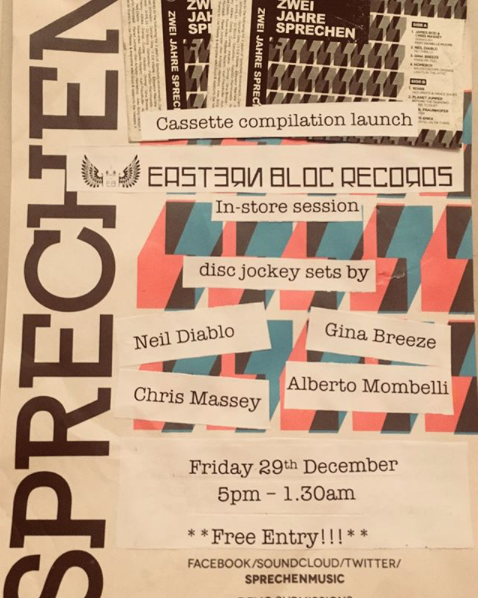 We're having an in-store launch for Two Years Of Sprechen cassette release at the legendary Eastern Bloc Records on Friday 29th December. Post Xmas workout from 5pm with a fine selection of selectors dropping the heat & beats until 1.30am...free entry....free best time ever had, guaranteed! NYE I will be warming up the Basement with some of Manchester's finest DJ's at Manchester's fabulous venue, The Refuge. Huge thanks for all the support this year!